In Draco’s math class, Draco has learned that to answer word problems and do math you have to ignore what makes sense and just do whatever you want till it makes the answer you want. Say you have a function that isn’t a function. Normally if you got that function you’d say it wasn’t one but in Draco’s math class you ignore that and graph it anyway. Say you have to find the perimeter of a window. you’d think you’d want to find only the outside but no you just find a bunch of inside measurements. Draco watched a documentary about William Randolph Hearst and Citizen Kane. It was like other documentaries but Draco did learn a valuable tip. You don’t have to be the first to write about something; you just have to do so in a way that makes it seem like you were. Though now Draco realizes that’s exactly what John Oliver is doing with Last Week Tonight. Maybe that’s the secret to success. In order to succeed Draco will follow their example and report to you, the reader some breaking news. According to reports it would seem that NASA has landed a man on the Moon. Sure some of you will doubt the authenticity of this report but do not fear. It was definitely not just a sound stage*wink wink*. Anyway, first man on the Moon, Christopher Columbus had to say “I have finally found India after all these years”. Sadly famed explorer was once again mistaken and India is still a mysterious country that no one has ever found. We will have to settle for the Moon and it’s cheese rather than rich abundant spices. That is all from Breaking News With Draco. Good Night. Unless you’re reading this at morning or afternoon. If you are reading at those times well good that time. If you’re reading this outside of time and space you’re amazing and should pat yourself on your back assuming that’s still possible. It’s a difficult time right now. There are times when moving forward seems impossible and everything is hopeless. Sadly for hopeless, not moving forward isn’t an option. There is too much invested and too many lives lost. Draco shall not surrender. The enemy seems relentless but using all the will Draco has left Draco shall defeat them. Draco shall win this Facebook Poke War. That Draco swears to you, the reader. Even if Draco’s fingers are turned to dust( If Draco’s fingers are turned to dust in reality Draco would probably give up. Honestly why would you want to hold Draco to any of this? Weirdo. Draco ain’t actually making any promises. This is over-dramatized nonsense so don’t take it at face value.) Draco would keep on poking. Draco is like Commander Shepard waking up in London in a pile of ruble, getting up to use the real Crucible with the one option of actually working with no drawbacks to actually satisfy fans. Draco shall free the galaxy from the cycle of poking by poking the other person so much they stop. Hoorah! Draco saw Dolphin Tale 2. It had dolphins what more could you want from a movie? Turtles? Well guess what, there was a turtle; your abnormally high standards have been met. Hopefully real life continues to happen so they can continue to base movies off it. Great job real life for making this movie the first time and good job Dolphin Tale 2 on being great too. On a side note Draco used all of the to/too/two aka 2 forms in one paragraph. Parades are inbound. Draco was on twitter and saw some good cosplay. The thing with the costumes that aren’t on Halloween if you don’t know what that is *cough* Google Chrome Spellchecker *cough*. Anyway Draco started following that person (which sounds creepy without the Twitter context) and they said they were going to see Beverly Hills Chihuahuas 4. Four. The Four installment. Draco remembers a straight to DVD/Bluray sequel but 4? They made a 3 after that? The first one was sorta cute but they did that many? When did all this happen? Did you hear about any of these sequels reader? Did you keep it a secret from Draco? How dare you, reader Draco has never met. How dare yoooooouuuuuu (Don’t actually feel bad please). So Draco was planning on finally fixing some mistakes in Draco’s stories so they could actually be shown to people. Naturally Draco ignored all of that and finished Watch_Dogs instead. Draco loved the ending. Well except for Jordi stuff. The non-specific events there were less than great. All in all Draco has one thing to say about it. CBS, if you want to compete and blow NBC’s Scorpion out of the water and have a show that could last maybe 8 or 9 seasons acquire the rights to Watch_Dogs or collaborate with Ubisoft. Watch_Dogs is exactly your style and the name alone will bring in people. It would be great for you. On a side note ABC you could get it too but honestly you have Agents of Shield and that feels like it fills the slot. You could get it and just lock everyone out but honestly we’re trying to be fair here so don’t be offended by this being targeted at CBS. On a side side note Why does Draco imagine anyone from either would ever read any of this? Maybe FOX will see this but the Big Three not a chance. FOX has been great though lately so woo! Rolling the Tv dice. So Draco has continued the exercise of watching commercials for films Draco doesn’t plan to watch. God’s Not Dead appears to be about a philosophy class with an instructor who didn’t feel like doing his job of teach students about philosophy and stated that since he didn’t want to waste time about whether there is a God by forcing all students to write that he is dead. If this is not what it is about well they should make a better commercial. Now Draco’s problem with this isn’t anything to do with religion or whether God does or does not exist (though Draco does if you were wondering). You see the definition of dead as defined by a Google search of “dead definition” is no longer alive. The definition of alive was “not dead”. On further investigation on the word alive the word existing came up. You see if you do not exist you cannot be alive. Being alive requires existence. If God were dead as the instructor says then he is confirming to the class the God does exist. To be dead one must for at least a moment been alive. To be dead one must exist and must have ceased living. The entire premise of the student being forced to prove God exists is flawed because that is the entire basis for the instructor’s assertion that God is dead. The student is only agreeing with him. The burden of proof is meaningless because they are in agreement. Even if they weren’t and it was just bad language it is still up to the instructor to not only prove his point but also do his job and teach philosophy. If this were a true story(which honestly people are stupid and it could possibly be (It seems so uninteresting that Draco can’t be bothered to look it up)) this instructor is hopefully fired for proposing not to do a large section of the subject and wasting time trying to get out of it. That’s like teaching English but leaving out all the adjectives and adverbs. Draco has heard much about this dumping a bucket of ice on ones head for ALS. Draco has read many comments calling it stupid and then many comments calling those people who previously called it stupid stupid. They then defend it for all the money and awareness raising it has done. The problem is that both parties are correct. Pouring a bucket of ice water on one’s head is stupid whether it is for charity or not. You can actually die from it if you’re not warmed up.The dumping of the ice is the stupid part. The helpful part is that it raised awareness and money. It certainly did help and that isn’t debatable. You see a stupid action can be helpful if used correctly. Fart jokes for colon cancer would be stupid but it would also probably spread quickly and raise money. Setting your self on fire for burn victims would be another example but odds are that would do more harm than good. The moral to this story is that you should never set yourself on fire no matter how charitable it is. Setting yourself on fire is stupid and you should know better. The other moral is something stupid can alos be something that helps many people and in vice versa. So Draco saw this Guardians of the Galaxy movie today. Let Draco tell you they sure did guard the Galaxy. They did that very well. They also did a good job being a movie. Primarily Rocket Raccoon (talking mercenary raccoon who enjoys shooting things and sassing people) dancing with tropes and being awesome and adorable simultaneously and Groot(The cutest tree you ever did meet unless he branched you in the face in which case he is less cute) being worthy of his own genre of movies all staring Groot. Titanic with Groot maybe? Groot Scarface? Groot Avatar? That would be good. On a non Groot note Chris Pratt continues to be good in all his roles which are all eerily similar. Lucky for him they’re all fantastically done and work well in the story. So while at the theater to see the aforementioned movie a little preshow commercial says “We take pride in our clean theaters. Please clean up before you leave.” but in all the years of going there this theater has never been clean. The nice thing was that some seats were not covered in gum. Now every row has gum covered seats and that isn’t ok. It’s been years since some of the gum was placed there. Someone for God’s sake clean the seats. Hypocritical little censored words. When a Drive In is cleaner than and indoor theater you have a problem. So the other day Draco’s Mom was looking at Bleach stuff and she called the character Kon by the name Conan. It’s an easy mistake really and it gave Draco the desire to make this. How great is that? 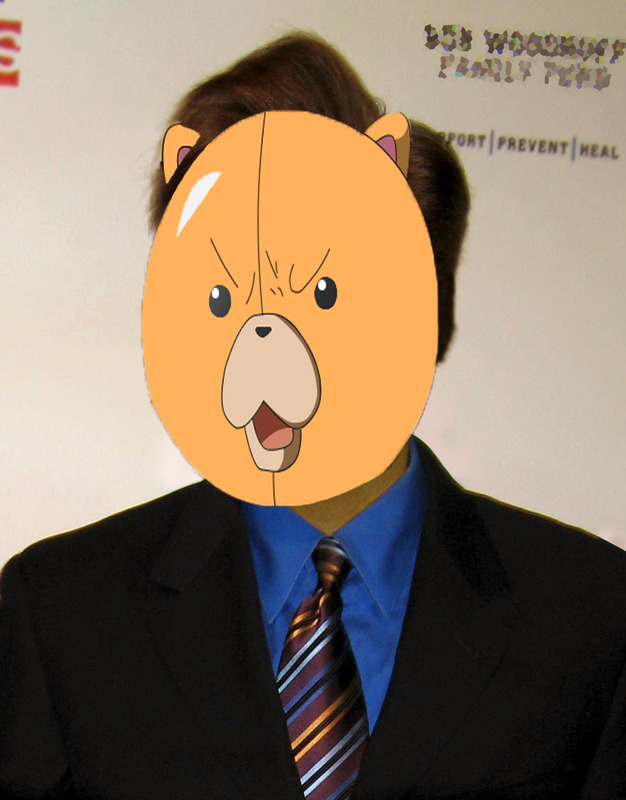 It’s Konan O’Brien. Great Ideas can come from anywhere. Even your mom. Draco love you mom. Draco saw a variety of great movies lately. Draco believes the number is 5. All of them were good. One that people seem to not think was very good was the newest Transformers. Draco doesn’t get that. Giant robots fighting each other is what was advertised and that is what Draco got. Plus most of the people people were at least better than the others. No one wore a bag on their head and it was all action-y. That’s perfect for that genre. Another movie Draco saw was Red 2. This one is basically the same idea but replace giant robots with old people. It was good but honestly there were problems of just random explosions happening from nothing and there was a bit of cheese. That was sad but still good. Next was How To Train Your Dragon 2. That was just great. It made Draco emotional on occasion and it looked great. It was in 3D but that was pointless and it didn’t look 3D. What it looked like was fantastic. A truly adorable really cool movie. Next is Iron Man 3. Really Draco wasn’t that big a fan of Iron Man 2. They could have had him in a super high tech cardboard box and it would have been good. Much better than the last. Really anything could have been better than the last. The last was lame. Finally and probably the best out of the lot was Winter’s Tale. It was just so sweet. Draco did a quick check to see what others thought and apparently others don’t have a soul. It’s the only thing that made Draco’s nearly deadly planeride which of course never happened because Draco was actually in a space ship bearable. Draco’s heart was all broken and warmed and happy and adjectives and synonyms of those adjective and using the word and till it kicks grammar in the face. Draco wants a magic horse to lead Draco to that girl from Downton Abbey(Draco thinks that the actress in the movie was the one for Sybil (actor* apparently actress is no longer used) or really any nice girl and then we go on an adventure while fighting a demon who has a nice Irish accent. Draco was scrolling though the ole’ Facebook the other day when Draco read ” In 10 years some of us could be married” some other thing, ” and some of us could be dead. That scares me.” That had to be about the 19th time Draco had read that. Perhaps in 10 years people will stop posting the same quotes over and over again. Perhaps those people that’ll be dead in 10 years are the idiots who have nothing better to do then copy and paste this nonsense. Cause of death was dehydration because they were far too busy repeatedly posting and drooling on their keyboards to get a glass of water. What scares Draco is how single-minded and two-dimensional these people are. If you gave ants computers they’d be posting the same junk and ants are working on a hive mind. Anyway all and all and to sum this up in one big bow is Draco hates these posts and if you post stuff like this you should get your ear flicked and have a pebble in your shoe for the rest of your year or till you stop. Be thankful Draco is merciful. Arstaklabinyald friends. On this day Draco learned one of their words. It means “Wow I’m stiff it feels better to stretch”. Anyway today seemed slightly less hospitable but also fun. It seems the inhabitants are bothered by the Draconian Armada but One brought Draco to movies and movies are great. Also they bought nice stuff for Draco t remember them by. Also the connection seems better today. The word “seems” seems to be showing up more though. So annoying. oh god the connection is really bad. It was a d list movie cookie cutter but meh. Draco might mention all the space pokemon-ing though. Gosh this is horrible. Why can’t the internet be better-er? Gah. You’ll never know o Draco’s Pidgey.